The Dores Inn is right next door to the cottage and provides tasty bar meals and good "craic" all the year round. However, the public bar, main entrance and car park are at the end furthest from the cottage so the noise does not impinge on the tranquillity of the cottage. 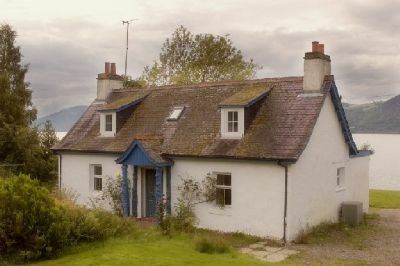 Cameron Cottage consists of two bedrooms upstairs, one a king-size and the other a twin, both with fabulous views of the loch out of their double-glazed dormer windows. Down the quaint original staircase is another twin bedroom and the bathroom. (This staircase is steep and narrow, a factor which you should take into account when deciding whether this property is for you.) There is a cosy lounge with a fireplace for which you will find a supply of logs in the woodshed. However, you are unlikely to need this as a source of heat as the whole cottage is heated with oil central heating. On the loch side of the house is the open plan kitchen and dining room with views of the Loch to die for.